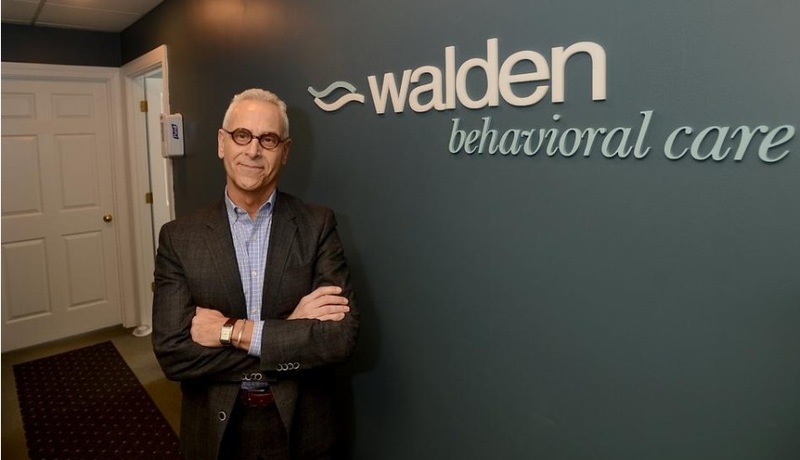 Walden Behavioral Care has been making news – good news, to be specific. This month, the Waltham-based company purchased the Atlanta Center for Eating Disorders and in December opened a treatment clinic in Milford. Walden’s owner, Stuart Koman, recently discussed the company with Daily News staff writer Bob Tremblay. We started Walden Behavioral Care at the former Waltham Hospital in 2003. While we were our own entity, I wanted to maintain the hospital’s connection to Waltham and surrounding communities, since it first opened in 1885. The “Wal” part is a testament to that. Additionally, nearby Walden Pond is suggestive of the hope and inspiration we strive to create for individuals and families each day. Together, Walden made perfect sense for us. Walden is headquartered in Waltham, but we have 11 locations throughout New England, many conveniently accessible to those in MetroWest. In Waltham, we continue to offer inpatient treatment at our original location, 9 Hope Ave. in Waltham. Our residential program is adjacent to the hospital and we offer partial hospitalization and intensive outpatient programs in a separate location at Suite 2000, 69 Hickory Drive. Our newest clinic for intensive outpatient treatment is at Suite 201, 229 East Main St., Milford. In addition, area residents may also receive partial hospitalization and intensive outpatient treatment at our Worcester clinic, 335 Chandler St.
We wanted to provide the best chance of a lasting recovery for those struggling with eating disorders and other psychiatric conditions. Thirty million Americans will be impacted by eating disorders in their lifetime. They have the highest mortality rate among all psychiatric disorders – 20 percent of those who don’t receive treatment will unfortunately die as a result of the disorder. That’s staggering and, frankly, unacceptable. I wanted to help change that, giving those impacted the best possible help and support, as close to home as possible. In the early 1990s, I created Choate Health Systems Inc., a managed health care company providing a full continuum of treatment services. That organization helped revitalize what was formerly known as Choate Memorial Hospital in Woburn. About 10 years later, I received a call from Marylou Sudders, then Massachusetts commissioner of Mental Health (she’s now secretary of Health and Human Services for the Commonwealth of Massachusetts). She asked if I could take a similar approach with Waltham Hospital. The facility, which housed dedicated psychiatric and eating disorders units, was facing closure, placing these critical services in jeopardy. The small eating disorder unit was the only one of its kind in New England, so there was high demand among individuals, families and referring health care providers. The opportunity to not only preserve, but build on, its success was truly unique. In time, Walden had a license and was operating a 23-bed inpatient unit within the building. Today, we’re proud to have 11 locations across New England, serving more than nearly 17,000 individuals since our founding in 2003. Why did you choose your current locale? I like to think our original Waltham location chose us. We recognized that the former Waltham Hospital, located just 10 miles outside of Boston and near several major highways, provided an ideal location for inpatient care and a chance to make a lasting difference for those around New England, who until then, often had to travel hundreds (if not thousands) of miles to receive the best treatment. What we soon realized, though, is that treatment doesn’t end when someone is medically stabilized – in fact, it’s just beginning. There were limited, if any, local options to confidently send patients to upon discharge. As a result, we continued to build our community-based approach with the establishment of our eight outpatient clinics, as well as a residential facility. While 24/7 care is absolutely essential in select cases, one’s road to recovery is mostly spent in lower levels of care. Our belief is that individuals receiving treatment should be as close to home as possible, with minimal interruptions to their daily lives. I’m proud to say many of our current patients live at home, go to school and maintain their jobs while in treatment. No matter where you live in MetroWest, the best possible treatment is no more than an hour away. Our new Milford location is no exception. We saw a small gap in dedicated eating disorder treatment for residents in MetroWest, the Blackstone Valley and southeastern Massachusetts. Given that Milford is such a great community, and located directly off Interstate 495, it made perfect sense for us. We also have great relationships with many health care providers nearby. We’ve seen phenomenal growth. Since starting in 2003, we’ve opened 11 locations across Massachusetts and Connecticut. We operate two inpatient units, a residential facility and eight ambulatory clinics, including the Milford clinic. We’re not stopping there – we always have our eyes set on any strategic business development and expansion opportunities aimed at providing even more convenient care for individuals and families across the region. A: I had unique opportunities to create and develop several other behavioral health care companies prior to Walden. I was the founder of Koman Associates, co-founder of Choate Health Systems Inc. (CHSI), president of Charles River Management (CRHM), and a senior clinician and director of adolescent programs at the former Charles River Hospital (CRH). A: Walden is the third company I created under my mission of providing behavioral health treatment to under-served populations. Prior to Walden, I co-founded Choate Health Systems Inc., a managed health care company offering a full continuum of treatment services. In 1995, I also started Koman Associates, which focused on leadership issues within the government, health care and business sectors. I consider myself extremely privileged to have worked with many of the best clinicians, staff and clients around. There is no way I would be where I am today without them. Walden provides personalized treatment and support for individuals and families impacted by all forms of eating disorders, including anorexia, bulimia, binge eating disorder, ARFID (avoidant/restrictive food intake disorder) and all other types of disordered eating. Our specialized focus is on the evidence-based behavioral therapy and skills training proven to provide the best chance for a lasting recovery. We also ensure that treatment is close to home as possible. Like most mental health conditions, recovery from an eating disorder doesn’t happen overnight. While it’s absolutely possible, it takes time – sometimes months or even years. There are often many challenges and setbacks. Walden’s full system of care, which includes inpatient, residential, partial hospitalization, intensive outpatient and outpatient care, means the right level of treatment and support is always available nearby. We are the only community-based eating disorder provider in New England offering all levels of care – inpatient, residential, partial hospitalization, intensive outpatient (IOP) and outpatient treatment. This means that no matter your background, individual needs or complexity of the disorder, you’ll always receive the personalized care and support you deserve. And it’s always a short drive away. Like most health-care providers, cost always varies between individuals. Walden’s commitment, though, is making eating disorder treatment as accessible and cost-efficient as possible. We have contracted with most major insurance carriers, and we accept individuals of all genders and ages. Walden is a private company, but has experienced approximately 20 percent growth year after year. Walden is always exploring additional locations – both in New England and nationally – to ensure the most convenient and accessible care for individuals and families in need. In fact, earlier this month, we acquired the Atlanta Center for Eating Disorders, which has three locations throughout Georgia. Our hope is to develop a localized full system of care, similar to what we’ve done in New England, down there. While we work to minimize cases, eating disorders aren’t going away – and we want to help as many people as possible. Our dedicated team of more than 350 clinicians and staff is specialized in eating disorders, and includes physicians, nurse practitioners, nurses, dietitians, mental health counselors and therapists, among others. We are independently owned.